Having made him captain and seen Paul Pogba lead his Man Utd side to a win in their opener against Leicester City last week, it would appear all is well for Jose Mourinho and his star man. The Red Devils made a winning start to the campaign after a difficult pre-season, and despite having only returned to training earlier in the week, Pogba showed his commitment to make himself available to help seal the victory. However, cracks seemingly started to appear after his comments following that win, where he suggested that he’s unable to give his best when he’s not happy, as per BBC Sport. 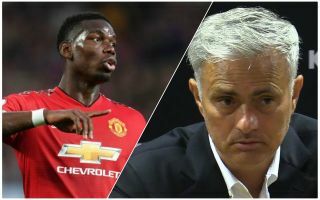 Whether that was a dig at Mourinho or a general issue that Pogba has at Man Utd was unclear, but now it’s claimed that the relationship between the pair appears to be significantly worsening. According to The Sun, not only have the pair had a row, but it’s claimed Mourinho has insisted to Pogba that if he’s unhappy, he should ask for a transfer while it’s added that the pair are no longer on speaking terms with the Frenchman said to have insisted on going through his agent for formal matters. Provided this is accurate, this is a nightmare situation for Man Utd to be in. Not only have they got their hands full as it is with trying to close the gap on champions Man City after finishing 19 points behind them last season while also trying to fend off Liverpool this year, they ended last season trophy-less and must improve this time round. The last thing that Mourinho needs then is to have trouble with his most talented player, as Pogba has proven when at his best for club and country, that he can be a dominant figure in midfield. Whether or not the reported damage can be repaired remains to be seen, but this is likely to be music to the ears of Barcelona, who have been heavily linked with a swoop for the Frenchman, as noted by the Daily Star. The Catalan giants may well be monitoring the situation closely if Pogba pushes for an exit from United, although it’s questionable as to whether a move would materialise this month given that the transfer window is already closed in England and so Man Utd won’t be able to sign a replacement immediately.